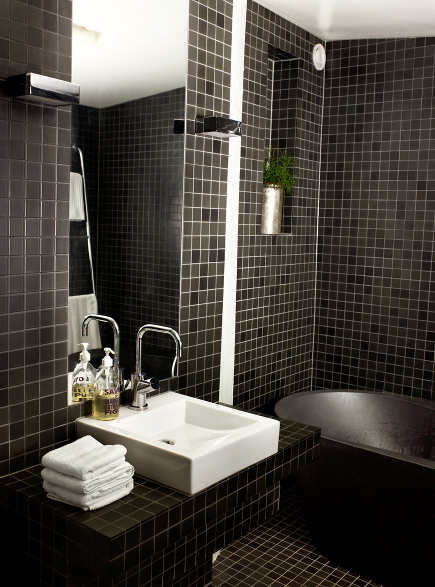 Ceramic, Moroccan zelij and patterned tiles are used in two modern black bathrooms in Europe. Modern black bathrooms have become a major trend with no sign of diminishing. The appeal of black as a neutral and the ease of leavening it with white elements – but no other color – seems to inspire great designers and DIY folk alike. 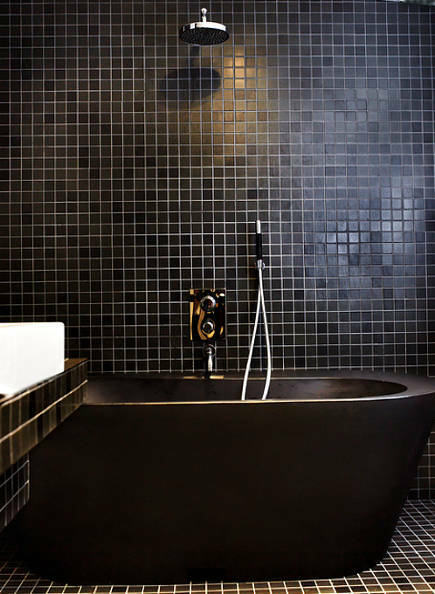 It’s a masculine take on a bath and black lends itself perfectly to modern and minimalist design ideas whether used in solid blocks or prints. The small Stockholm apartment of Swedish designer Jimmy Schonning [top & below] features black walls and floor, fully tiled in the way championed by mid-20th century architects – using small-scale square field tiles. With the white sink basin and light grout, it has a modern masculinity that reminds me of a tuxedo. Hopefully there is excellent lighting and, of course, a reflective white ceiling helps. I like the tall Mora kitchen faucet, another minimalist gesture. Adjacent to the sink, an open, wall mounted shower empties into a black resin slipper tub. While it lacks any shower enclosure, the tile floor serves it well as a wet room. 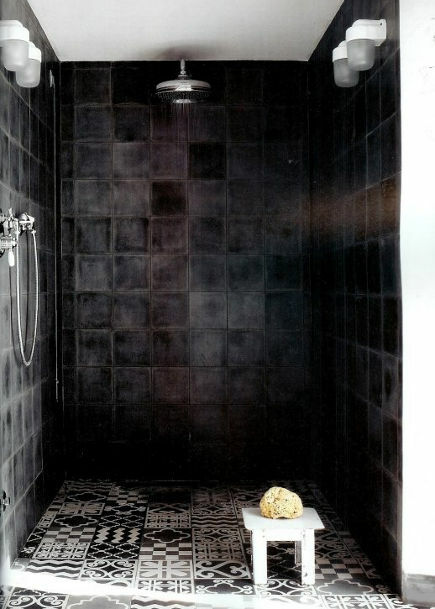 Black Moroccan zelij tiles have their own dramatic effect but seem a bit less formal in the shower of this master bath in a converted industrial building in Umbria, Italy. While the impact of their hue and scale is no less dramatic than the Schonning bathroom, the alternating pattern of black-and-white and gray-and-white cement tiles on the floor give it a playful, more feminine quality. At first glance, I thought this might be the same b&w pattern we loved in the Moroccan Tile Bath Allison wrote about last year – but no. The all-over patterning makes us adore cement tiles, especially this custom look from Carocim (a French supplier). These were commissioned by Italian design icon Paola Navone who designed the entire house for a prominent Italian couple. A quartet of vintage sauna lights, added in the shower, keep it from feeling too closed-in. Navone, who works in black-and-white and has a line of bathroom fixtures made by flaminia, chose an English slipper tub by Water Monopoly. She also repeated the combination of tile and wide-plank wood floors used elsewhere in the house – a vintage idea that has yet to gain traction but looks modern, fresh and practical to me.